This canopy from Quik Shade offers more than 100 square feet of remarkably cool shade thanks to a unique design incorporating trademarked protective fabric. It features cutting edge latch sliders and push pin leg extenders to help you set up your canopy as quickly and effortlessly as possible. When you purchase this shelter, you also receive a durable 300D carry bag to transport the canopy easily between your home, a park, a stadium, or any other venue for summer fun. Measuring 10' x 10', the canopy can also be adjusted between three heights in order to meet all your portable shelter needs this summer and beyond. When in carry bag how long is it. I need something around 4/5 feet long when in bag. 10/10 canopy. Thanks for your help. According to the manufacturer, the collapsed height is 48.8", length is 7.7", and width is 7.9". Are there side panels for this canopy? The manufacturer does offer wall panels that are compatible with this canopy. The correct part to use is the Quik Shade 10' x 10' Canopy Wall Panel for Straight Legs. What is the weight of this canopy? The Quik Shade Expedition EX100 10x10 Instant Canopy with Straight Legs has a published weight of 33 pounds. I haven't set it on a scale, but I would say around 30lbs. 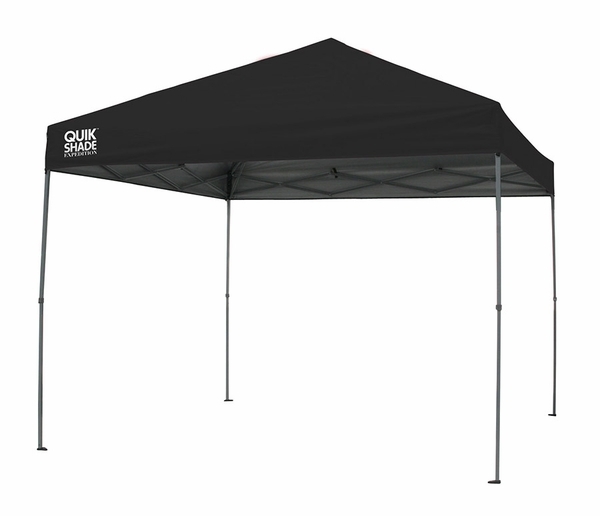 What colors does this Quik Shade Expedition EX100 10 x 10 instant canopy with straight legs come in? What is the canopy top made out of? Is it water resistant? This canopy is made of a water-resistant polyester, but it is not completely waterproof. At it's tallest setting, how high the lowest part of the roof and how high is the peak of this Quik Shade Expedition EX100 10 x 10 instant canopy with straight legs? The Quik Shade canopy is 7 feet tall on the sides and total height is 11 feet. Does the underside of this Quik Shade Expedition EX100 10x10 instant canopy with straight legs have the metal protective UV fabric? This canopy does indeed come with the Aluminex backed fabric. How big is this Quik Shade Expedition EX100 10 x 10 Instant Canopy when collapsed in the carry bag? What are the exact dimensions? Does Quik Shade make wall attachments for this Expedition EX100 10 x 10 instant canopy? The manufacturer does offer wall panels that are compatible with this canopy. The correct part to use is the Quik Shade 10x10 Canopy Wall Panel for Straight Legs. Can this Quik Shade Expedition EX100 instant canopy be set up on my back yard porch? Is it water proof? It is water resistant but not waterproof. It is also designed to be used and then taken down. If left unattended, weather damage could occur. This is true of all pop up canopies. Yes, it can be set up on your porch. I don't know of the water repellent though. Are do I secure the legs of this Quik Shade Expedition canopy to the ground? Are there pegs or is there an option to use pegs? The Quik Shade canopy will come with ropes and stakes to secure it to the ground. The legs do have foot pads as well. This canopy weighs 33 pounds. 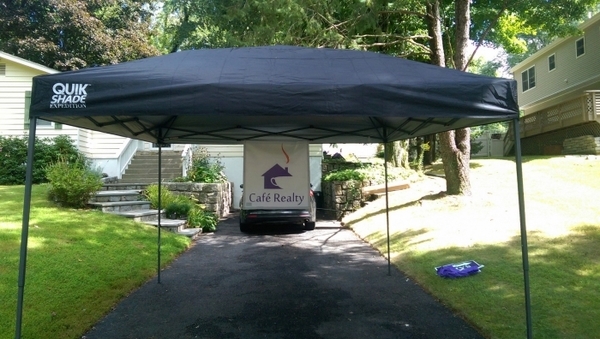 A great looking canopy and easy to assemble. We had 4 people and it went up in 5 minutes! ConsThe storage bag is not heavy duty enough.